“Does it matter where he is? Why bother making promises and spewing platitudes? Economies are crashing, markets are crashing…Obama is absent from reality…and burying his head in the proverbial sand and tickling his feet,” Governor Palin said tonight about the President’s planned 10-day vacation to Martha’s Vineyard on Greta Van Susteren’s TV show. The former Alaskan Governor was broadcasting from her home studio in Wasilla, Alaska. She said perception is bigger than reality and Obama’s vacation shows lack of leadership. Van Susteren said Americans typically look to our sitting President for leadership and inspiration, even if they don’t agree with him politically. She recounted how conservative governors such as herself vetoed portions of the trillion-dollar stimulus package, because it came with “fat strings attached to big, centralized government. It was not good for the Tenth Amendment and our sovereignties.” Gov. Palin predicted that Obama would attempt another stimulus package upon his return from Martha’s Vineyard. She said the Tea Party “is a good model for Congress to follow.” Most Tea Partiers have never been involved in government or politics before and many are independents. “We need to make common-sense decisions about the economy so we don’t go bankrupt,” she said. Gov. Palin said Sen. Hatch is doing well “in terms of trying to get a balanced budget.” She added that the Tea Party needs to “embrace his ideas for a balanced budget,” something he has been purusing for decades. In discussing Secretary of State Hillary Clinton calling for the Syrian president to step down, Van Susteren observed that Clinton looked Presidential – more so than Obama. Gov. Palin said that while she cannot speak for liberal Democrats, she suspects that today they would have voted for Hillary in the Democratic primary rather than Obama. Gov. Palin reflected on her gubernatorial inaugural address in which she said, “you can’t put faith in an individual. Government cannot make you happy, wealthy, or wise. We have to look within ourselves and create our own jobs. Let’s hire people. Be prudent, but be bold. Plan ahead. don’t wait for the elite bubble in Washington, D.C. Regarding the September 3 Tea Party rally to which she was invited, Gov. Palin answered Van Susteren’s question about her Presidential candidacy decision. “I’m still contemplating. I’m determined to get this country on the right track. You don’t need a title to make a difference and you don’t have to hold an office to make a difference. I’m living proof of that,” she said. Former Alaska Governor Sarah Palin tonight discussed the economy and the 2012 Presidential race on Lou Dobbs from her home studio in Wasilla, Alaska. 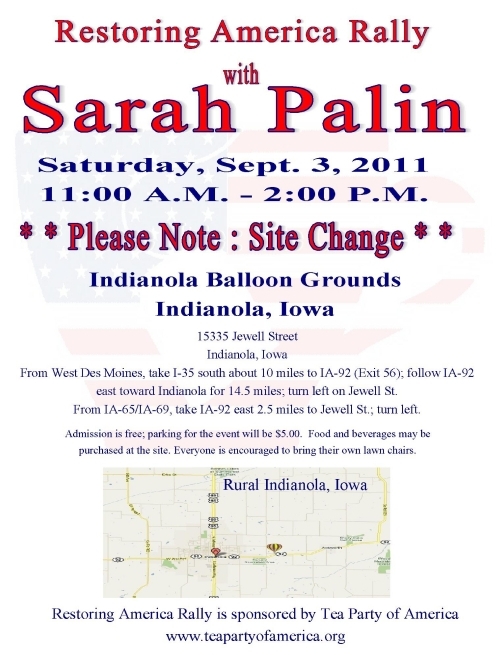 “The Iowa-based event hosts of the Restoring America Rally with Sarah Palin on September 3rd have decided to move the venue to a nearby location that better accommodates every eventuality. While the Hawkeye Antique Acres was a wonderful location, concerns had arisen with parking, especially in the event of inclement weather. The new location–the Indianola Balloon Grounds just south of Des Moines–has all of the quintessentially rural charm of the original site, but none of the logistical challenges. The event will still be held from 11 to 2 p.m. on Saturday, Labor Day Weekend, September 3rd, 2011. An updated flyer announcing the event–with the site change information–has been distributed. We continue to encourage everyone who can to attend this historic event. Note that this new location is close enough to the original site that any travel plans should not be affected. We’ll be keeping you informed with our new series, Road To Indianola. I was referred to this post and just now had a chance to read it. I reprint it for you here, because it’s THAT good. The Earth shook, time stood still, and every other cliche not doing her justice applied itself. It finally happened. I met former Alaska Governor Sarah Palin. She may be the loveliest woman on Earth, or at the very least Aphrodite’s better looking cousin. “They” were the devotees of Sarah Palin who sent me emails for an entire year promoting her. Palin right then and there showed she was smart, tenacious, and a figure who commanded a fierce loyalty from people who wanted her on the ticket. Governor Palin lit up the 2008 GOP Convention. I personally witnessed grown professional women in their forties and fifties crying their eyes out as she spoke. Her convention speech garnered higher ratings than the eventual presidential winner. It was like witnessing the newly discovered child of Ronald Reagan and Margaret Thatcher. The left needed to destroy her since they despise minority conservatives, especially religious ones to the right on social issues. Yet Sarah Palin did not lose the election for the GOP in 2008. Lehman Brothers burned. She was a jolt of energy to the ticket. In a very roundabout way, Governor Palin played a small role in my current success. She was supposed to be the keynote speaker at a major Republican Women’s function at the Reagan Library. She was unable to attend, creating a speaking slot. The original emcee became the keynote speaker and I was given 15 minutes. That speech launched my speaking career, since speaking at the Reagan Library captures conservative attention nationwide. Yet despite speaking all over the country and meeting many politicos, until now I had never met Sarah Palin. She is kept on lockdown due to the many threats she gets from deranged leftists who despise a woman they have never met. I have never been to Alaska, but thankfully she came to Iowa and I was there. My trip to Iowa began with plans to attend the debate and the straw poll. I scheduled a few speaking engagements, including some with presidential candidates. The Thursday debate and the Saturday straw poll left a void on Friday. I decided to attend the Iowa State Fair, since Des Moines is only an hour from Ames. While attending the state fair I heard rumors that Governor Palin was in attendance, but there was no way to even contemplate where she would be. Besides, I was busy cramming deliciously toxic edibles into my belly. After taking a bite into a Chicago-style hot dog, I heard a ton of commotion and a crowd of people. Everybody was trying to get close. I asked what it was, but I knew only one person at the Iowa State Fair would have that kind of star power. It had to her. This was quickly confirmed. My initial reaction was “not now!.” I had just begun this messy hot dog. There was only one thing to do. Rather than savor it, I crammed it into me like I was Joey Chestnut on July 4th, beginning the mad dash to get napkins and make my hands clean. I worked my way through the crowd (one of the only benefits of being short) quickly. I got within striking distance as security was letting one person through at a time for her protection. I turned around, and right there was Todd Palin. I exclaimed “You’re the First Dude.” He laughed and shook my hand. I spoke really quickly, due to a combination of nervous excitement and knowing I only had a few seconds. He gave permission, so I served up my best. He laughed, and out of nowhere she turned around. She liked the joke. She gave me a hug and I asked if I may take a picture with her. She said it was ok, but there was one problem. Due to sheer nerves I have not experienced since junior high school, I totally went brain dead and forgot how to work my cell phone camera. Her security guard tried to be patient, but many people wanted pictures with her. Finally I just pressed random buttons until one of them showed a camera. The picture was taken. I asked her if I could really quickly give her a gift. I showed it to her security guard, and he saw it was safe. He gave me a magic marker to write my name on the gift. I thought I was going to just give the gift to him to give to her, but Governor Palin accepted it from me personally, saw what it was, and thanked me. He told me to keep it. In my obliviousness I did not notice until much later that night that the Sharpie was autographed by Governor Palin. So she had my autograph and I had hers. I suspect I was more impressed. Later that night I was in the front row for a live taping of Hannity. Governor Palin was the first guest. Sean Hannity tossed out footballs with the show logo on it, and he autographed one for me. Yet just before the show started, Governor Palin came on stage and greeted the crowd. Yes, I was stunned. This woman meets hundreds of people by the minute, and it had been hours since she saw me for one of those minutes. I do have a distinct look with my Hawaiian shirt and 1940s style black fedora, but again, she meets tons of people. I did observe how she was with other people. She is kind, funny, and so incredibly genuine. There is zero snobbery or prima donna in her. She really is as lovely as she comes across. She really loves her fellow Mama Grizzlies. When they come up to her with their daughters, her face lights up. So many women are jealous of her because men want to go out with her and women want to be her. She was superwoman, balancing five children while governing an entire state and running for Vice President. The men admire any woman who hunts what she cooks and eats what she hunts, and can look feminine yet still grasp that ESPN is not the Spanish channel. She is what feminism should be about. Yet beyond all of that, I can finally confirm that she and the First Dude are as nice in person as they appear. They really are what they seem. Governor Palin, it was an honor and a thrill to meet you. My best to you and the First Dude. As for your thanking me…thank you for all you do. You just rock! Eric is the author of the book trilogy “Ideological Bigotry, “Ideological Violence,” and “Ideological Idiocy.” Eric is 100% alcohol, tobacco, drug, and liberalism free. After years of dating liberals, he has finally seen the light and now only dates Republican Jewish women. His family is pleased over this. Republican, Jewish women, you may contact Eric above.